but this is the most beautiful one I've ever seen in my entire life. Meet Renee' Amelie Zamora. My Baby, "Rain". Good Day Picky (and not so) Picky Eaters! Rina is on her 39th week of pregnancy, so we're expecting the Pickiest Little Eater any day soon. The birth of my daughter Rain will undoubtedly open a brand new chapter in my life that my wife and I are looking forward to. This is more exciting than the first time I went to Spiral Buffet, or when I returned to Harbor City in Cebu. This level of excitement is in a league of its own. With that being said, Please do not be surprised if I would abruptly need to go on hiatus for an undetermined amount of time. I will still most probably be posting on The Pickiest Eater In The World Facebook Page from time to time, so please "Like" that page or Follow me on Twitter for Updates. I honestly have no clue when or how long I'll be gone, but I wouldn't be surprised if I find ways to keep posting reviews even from the hospital (I heard there are some great restaurants within the vicinity of Medical City hehe) or something. 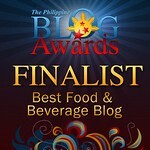 After doing this for more than a year, I can't imagine NOT blogging about food. True there are times that I get lazy to write, but the moment I get going, and when I get comments on a post or in my Facebook fan page, it just really reaffirms my love for food blogging. Please don't get this post wrong. I know it may sound like it, but I'm not saying goodbye. In fact, I'm going to be posting a new restaurant adventure with in the next couple of days. I'm just saying that Rina is giving birth soon, and I'll be gone for awhile.. Try not to miss me so much hehe.. Thanks for everything guys! Please do pray for the safe delivery of our Baby Rain, as well as the health of Rina.. and as for being first time parents.. Wish us both luck! I've got a lot of eating left to do, so ya'll can't get rid of me just yet! Thank you soooo much Eileen :) we're so excited!